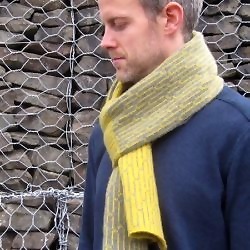 A designer-maker, based in my home studio in Glasgow, I specialise in designing and making bespoke and limited edition unisex knitted accessories for fashion and interiors. Signature, colourful, small-scale repeat patterns reflect my love of colour, geometry and repetition with the resulting designs playing with perceptions. Scarves feature reversed colour proportions in each half of the scarf, seams are hand stitched and labels are attached with the same yarns used to knit the product, linking the raw material to the final constructed fabric. Cushion covers are made to order in clients choice of design and colour combinations. A bespoke service is also offered where a new design can be commissioned to reflect your business or location or any of my designs can be made to order in your choice of colour combinations - ideal for unique or corporate gifts. Never without my camera, I find inspiration in all sorts of places with designs inspired by manhole covers, architectural details, the copper pot still, waves and the 'ferro' on a gondola. Bespoke machine knit and hand knit accessories. Available for commissions.